Starlings begin claiming nest sites in February. While Midwestern starlings tend to migrate, our starlings in Maryland remain in the area all winter. Some starling trappers report that starlings enter cavities in all months but August. My traps were empty this year from mid-July until Oct 2nd, when a juvenile was caught in the barn wall trap. But, the most productive time for using nest box traps is mid-winter through mid-summer. Where a large number of starlings are present, there will be an early peak in trapped birds as nest sites are sought and then another smaller peak as renesting begins after a failed first nesting. Starlings often nest in upward facing tree cavities where the young are drowned in the first rain storm. In Maryland, starlings sometimes have two broods, resulting in another peak in trap activity, especially where their original site is disrupted by the trapper. Natural cavities in yard trees can be temporarily plugged, causing the starlings to seek a new site, hopefully a starling trap. (Permanently plugging natural cavities - especially woodpecker excavated holes would defeat our purpose). In early summer there is a fourth peak in trapped starlings, this time composed entirely of juveniles. In June, three or four juveniles would frequently be caught in the tipping can barn trap each day. Earlier in the season, when adults were being caught, only a single pair would enter the trap on most days, and always before 9 am. Later in summer, the juveniles popped in any time during the day and were likely traveling together, although I seldom witnessed their entry. Continually thinning out starlings is an onerous task, but one that I now believe is effective. This year, our Northern flickers nested successfully and next year, I expect the crested flycatchers will also nest in our yard for the first time. Several hundred starlings were trapped in nest box traps or shot while perched on the flicker boxes or martin gourd rack. Next year it is likely that far fewer starlings will try to nest in our yard and the task of removing them will be much less time consuming. Luckily, the best time to observe nest box usurpers is early in the morning, before most people go to work. If you are using a video nest box trap, you can do it at your kitchen table while having a cup of coffee. May 22, 2003 update This spring, the starling population in our yard is approximately 1/3 the number present in 2002, thanks to the tipping can trap and pellet gun. However, this year's band of starlings have still managed to usurp the flicker nest box after it had been closely guarded by a pair of Northern flickers for three weeks. All starlings using nest boxes were promptly shot or trapped, but the flickers have still not returned to their nest box 8 days after a fierce battle with a starling. Each spring, more starlings will filter in to our yard from the surrounding area, making continual vigilance necessary. But, at least, now, our property is a starling sink, with many of the new recruits from surrounding farms entering the tipping can traps. Aug 1, 2004 update - This season, 150 starlings have been caught in a variety of nest box traps. 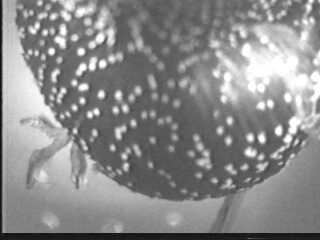 Some of the traps have been monitored with infrared video cameras placed inside the trap and at the outside perch, revealing interesting facts about how well the traps work, how often they don’t work, and why. The instant feedback from the videotape has also allowed me to develop and modify a new automatic trap that appears more reliable than the tipping can traps. In the graph at left, all starlings were adults until week 21, beginning June 15. The 15 starlings caught that week were all juveniles, as were those caught in the following two weeks. These recently fledged birds were all caught in the two traps on the north east corner of the barn. The timing coincided with the ripening of fruit on a large American mulberry tree 75 ft from these traps. Oddly, native birds had this tree to themselves for about a week before the starlings discovered it. Many species, including Baltimore orioles, were feasting on the berries. 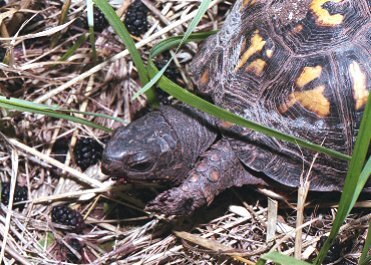 I ate my share and observed a box turtle doing the same, its mouth and much of its body stained purple from the layer of berries that had fallen to the ground. But, once the roving band of starlings discovered this tree, the fruit was gone in several days. Several hundred starlings were feeding at once, many of them flying to the roof of the barn to eat a berry and some landing on the trap perches. For some reason, a few of the juveniles just couldn't resist entering the traps. In spite of their late arrival, most of the fruit on this tree was consumed by starlings. There are a large number of volunteer mulberry trees on our property, most of which were probably picked clean by starlings. The sheer number of starlings in many areas of the country can deplete the natural food supply needed by native species. 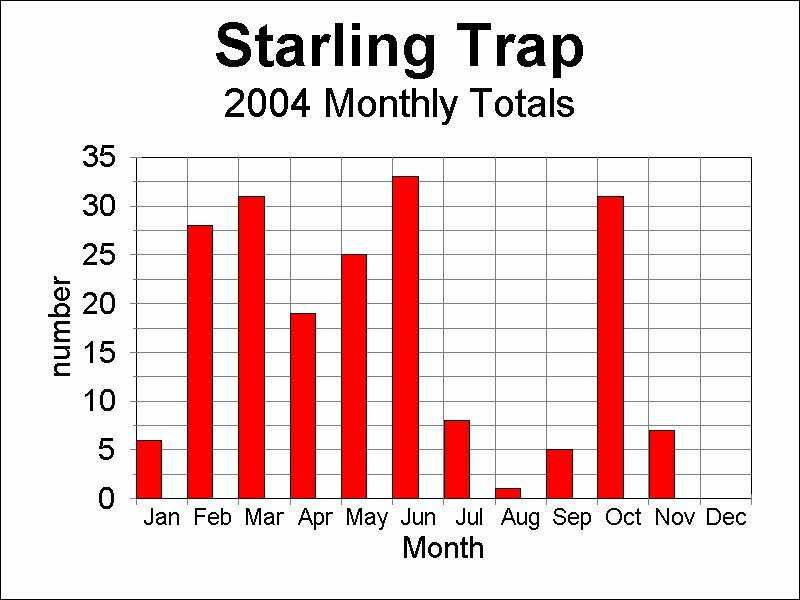 Sept 28, 2004 update: Since posting the above spring trap data, 1 juvenile starling was trapped in August and 5 in September. All were caught in the northeast trap, an interior trap with small holding cage. Also, the first ever native species was caught. A female Northern flicker entered the southwest trap, an interior trap with aviary holding cage. Rather than reaching in the small door of the aviary and catching the bird, I opened the entire front panel, releasing it into the barn. I thought this would cause it less distress than being caught by hand. The large barn doors were open, spanning 40 ft by 16 feet high, but, the flicker took 4 hours to find its way out of the barn. The next day the flicker entered the trap again, and, this time I reached into the aviary and caught the bird as I do the starlings, then released it outside. Several different species have entered the hayloft when the large doors were open and had difficulty finding their way out. Flickers, cardinals, catbirds, robins, mockingbirds, and even barn swallows have had this problem. The birds fly up near the peak of the roof and then continually fly back and forth, hitting the windows at each end. The windows are dirty enough from all the wasps and flies that the birds don't crash into them, but, rather, pull back at the last moment, tap the glass and immediately turn around and fly back to the other end, or alight to rest for a moment. It appears that the birds are looking for sky and all they can see out the huge open doors is ground, since they are flying much higher than the doors. The only sky they can see is through the highest windows on the gable ends. I wonder if they would fly toward a large mirror placed on the ground outside the doorway so that it would reflect the sky? If so, long before they neared the mirror, they would be outside, with the sky above them, so its not likely they would continue downward to strike the mirror on the ground. 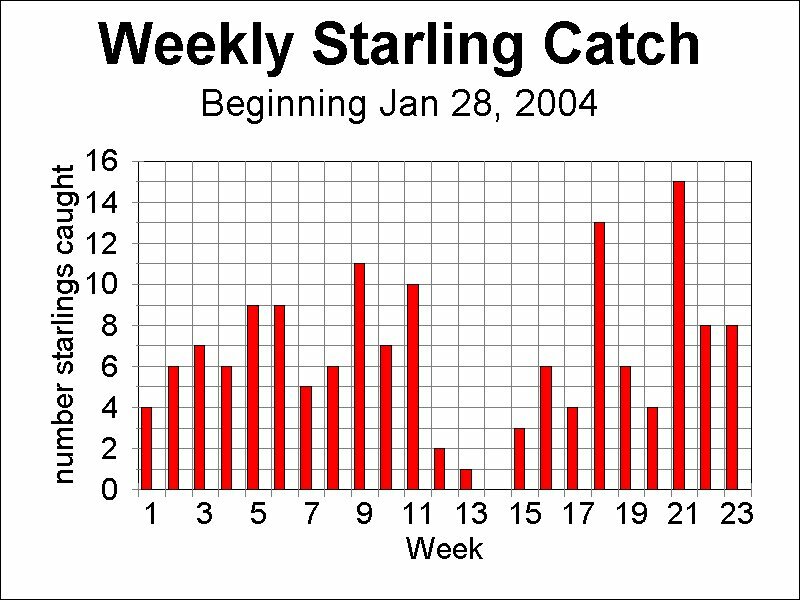 Nov 1, 2004 updateA total of 31 starlings were caught in October. I think this is an all time high, but I haven't kept off season records in previous years. These starlings wandering into our yard and entering traps in the fall are an important reason for leaving the traps up year round. Many people tend to worry about starlings only during the nesting season, but every starling removed in the fall is one less to destroy a flicker or purple martin nest next spring. However, it is especially important to frequently monitor traps in fall. For the first time ever, a bluebird entered one of the wall mounted traps this week. While working on the scaffold behind the barn, I also observed 8 bluebirds taking turns entering a flycatcher nest box high in a tree. In the nesting season, these bluebirds would have shown no interest in such a location, but, their requirements for winter shelter may be quite different than for a nest site. While I hated to see my three year record broken of no native species entering the wall mounted traps, both the flicker and bluebird seemed to take there trip down the tube quite well. The flicker even entered again the next day. But, remember to remove the holding cage when traps can't be monitored frequently. If you work at home or are near your trap during the day, and have a nest cam, adapting the cam to monitor your starling trap is easy. 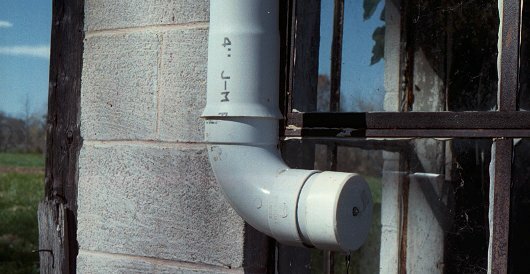 A 4" pvc elbow and short piece of 4" tube replaces the holding cage and the camera housing slips onto the tube. The camera elbow should replace the cage only when it can be monitored continuously. I place a small video monitor beside my computer when working in the office. When leaving the office, it is a simple matter to remove the camera and replace the cage. The increase in daily catches in mid-June was due primarily to the appearance of roving bands of juveniles. I first noted a flock of 54 mostly juveniles land on the barn roof on June 14. As in previous years, their interest was in the large mulberry tree near the northeast corner of the barn. And, as in previous years, they devoured the ripening fruit in several days that would otherwise have provided a major food source for dozens of native species for several weeks. Today, June 30, 2005, five juveniles were trapped at the corner trap by the mulberry tree and one adult at the opposite corner of the barn. This year, it appears that we have fewer resident starlings who had previously nested nearby, but, as many or more transients, passing through the yard and entering the wall mounted traps or competing for nest boxes and tree cavities. This would be expected, since traps have been used in our yard for several years. It also suggests that trapping doesn't make a dent in the surrounding starling population. Particularly distressing is the large number of juveniles that enter the yard each June. They obviously fledged from farm yards and small towns nearby and some who aren't caught in the barn traps will be back next spring, looking for a nest site. We have had a successful flicker nesting this year, and, for the first time, had two pairs of flickers simultaneously nesting in our yard. A combination of providing alternative nest sites and continually removing starlings to keep this alternative housing available appears to be the key to success in saving our flickers. As long as comparable housing is available nearby, starlings seem not to bother flickers, but, if the 2nd nest box isn't kept free by removing starlings, the next starling pair to enter the yard will attack the flickers, rather than the starlings in the decoy box. The use of such decoy starling boxes has also proven useful when placed near the purple martin gourd rack. Starlings pay absolutely no attention to the plastic super gourds when a large, deep flicker box is available nearby. Again, when a starling pair claim the decoy box, they must be removed so the next pair entering the yard, in search of a nest site, will go to the box instead of a plastic gourd. 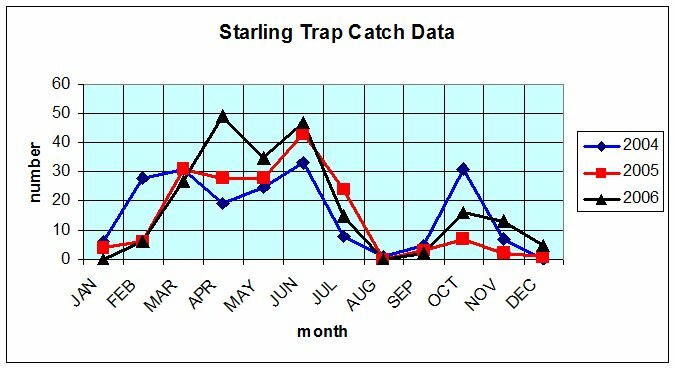 The October spike in trap activity was 1/4 that of the previous year. Also, starlings were rarely seen in our immediate area during fall and early winter. West Nile?? Only recently (January 2006) have I noticed large flocks of starlings pass over. But, I have no idea if the starling population county wide had actually decreased. Native cavity nesters have been busily inspecting nest sites this week.Four bluebirds were on and in the slant lid camera box in the back yard yesterday and flickers are continually entering several boxes. Not a starling to be seen in the yard! Starlings have returned to our yard and are methodically inspecting all the flicker boxes and natural cavities. While their numbers are smaller, they still present the same problem as in previous years. Whether its multiflora rose or European starlings, controlling the most aggressive alien species is a never-ending task. June 30 update - While starlings have been entering the traps in large numbers this spring, the martin and flicker housing has been starling free. Northern Flickers have nested in a flycatcher box in the pines with no interference. This box required continual monitoring in previous years. Also, the decoy box near the martin gourds has worked perfectly. Two pairs of starlings used the decoy box before the martins returned and none showed any interest in the plastic gourds. Two male house sparrows did take an interest in the gourds. I shot the first, and missed the second (twice), but he never returned. January 2007 update Catch data for the previous three years are plotted on the chart above. Note that the sharp spike in October of 2004 is much reduced in both 05 and 06. This may be due to the variation in autumn weather each year. Also, there is no downward trend in the number caught, as I had hoped. From the 2004 baseline of 194, the annual total dropped to 177 in 2005, then rose to 215 in 2006. However, 2006 is the first year that starlings didn't interfere with native species nesting in our yard. My impression is that even though many starlings discovered our yard, they first found the building mounted traps and were caught before having time to consider the gourds or flicker boxes. What has changed over the past few years is that we have very few resident starlings. There are still several pairs in the highest limbs of the front yard sycamores who show no interest in nest boxes, even when placed in or near the trees. Will any offspring reared in these trees tend to carry on this tradition? My guess is yes. May - the first 5 days in May have been quite cold, dark and wet and 29 starlings have entered the traps. Another 6 have been trapped in flicker box A. It looks like the starling season has been somewhat delayed this year. But, it also looks like it may be one of the busiest years yet. The nest cam in flicker box A has recorded new pairs of starlings quickly replacing trapped pairs. Details of this will be entered on the flicker pages, and, hopefully, flickers will be using the box by then. July 23, 2010 update - Flicker nestboxes A and B, mounted on the barn wall, were video monitored and starlings removed. The interactions of flickers, starlings, kestrels and house wrens in these two boxes from Dec 2008 to June 29, 2010 has been fascinating to observe. But, these observations have convinced me that it is far more important to monitor and protect individual flicker boxes than to reduce the overall starling population, using repeating traps. We had far fewer starlings in the area this year, likely due to unusually long periods of snow cover last winter, but still had to remove many pairs of starlings from the flicker boxes. While I am continuing to use 3 repeating starling traps on the barn walls, my main focus is on video monitoring whichever box the flickers choose and trapping any starlings that attempt to usurp that box. Jan 29, 2011 update The Northern flickers successfully nested in box S last summer, while kestrels nested in box A. The female kestrel has spent many nights in Box A this winter, but the pair of flickers roost under the barn eaves. Starlings are occasionally visiting Box A and are frequently being caught in the repeating traps. &COPY; 2002 - 2013, American Artifacts and Richard Van Vleck, Taneytown, Maryland.